Well, 2016 is over. Hallelujah. I had many high moments in 2016: I graduated college, bought a house, got a puppy, married my high school sweetheart, started law school and made some amazing new friends. However, 2016 was also pretty rough at times... I lost some friends, I dealt with some personal challenges, I lost a dog, was academically challenged more than I ever have been in my life and moved to a new city. After first-semester law school finals and a leaking toilet that flooded my house, I am ready for a new year. 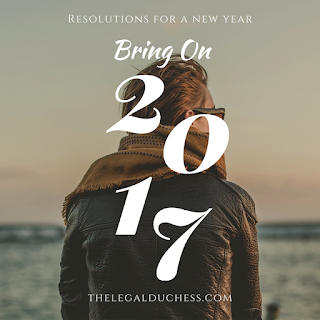 I am looking forward to bigger and better things in 2017. I already changed my hair color (hello brunette) and purged my closet but I need more. I am ready for some personal changes. I have many resolutions but here I am just outlining my top 6. I have never been a good exercise-r nor strict about a healthy diet. I am notorious for going to the gym for a few weeks and falling off the wagon and reaching for donuts whenever I have the craving. This year, I am determined to break this bad habit. After spending a semester without sports, drinking my weight in coffee and sitting in front of casebooks 24/7, I weigh the most I ever have in my life and I am completely not okay with this. It is time to get it under control and get healthy. Smoothies, Yoga, vitamins and gym time is in my future! I was not content with my first semester grades or GPA. I now know that I need to kick it into even higher gear to get on top of it. I knew the information but did not test well so I see lots of practice tests, hypos and multiple choice in my future. I did not stay as current with blogging as I had hoped once Law School got busy. I am making a personal goal to blog twice a week and try to gain some income from this little blog of mine. I am almost 23 and I still have acne and terrible dry skin. It is time to get a grown-up skin routine and get this under control. I asked for Sephora gift cards Christmas so I can go get some "grown-up" products, throw away my drugstore products and make my skin healthier than it has ever been! I have been married for nearly 6 months and though we are doing great, I want to reaffirm and continue to put my marriage and my husband first. That is what is most important in life and I do not want to lose sight of that. Who knows if I will stick to it but thats my goals and resolutions for 2017!